In yesterday’s “who’s more bullish for Precious Metals – Macron or Le Pen?,” I started with nearly five pages of cold, hard facts – proving across-the-board market manipulation of essentially all Western markets. Which, for the sole purpose of prolonging a terminally ill monetary status quo – in which 1% benefit, at the expense of not just the “99%,” but future generations of “99-percenters” – has created “dotcom-like valuations in a Great Depression Era.” Not to mention, sentiment – per yesterday’s 24-year low close of the VIX volatility index. Thankfully, the Fed Governors has everything under control – like St. Louis Fed President James Bullard, who claims “equity valuations are high, but nothing like the (2008) housing bubble.” Which is correct, in a way – given that they are more like the valuations seen atop the 2000 dotcom bubble. Such manipulation, increasingly blatant with each passing day – and per above, admitted; accelerated in what I deemed the “point of no return” moment in 2011. 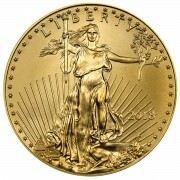 When, following three years of chaotic, post-2008 “market-saving” policies failed – as highlighted by that summer’s European sovereign debt crisis; the U.S. government having its Triple-A credit rating stripped; and dollar-priced gold hitting an all-time high; “they” decided the only way to kick the can further was via 24/7 market manipulation. Coupled, of course, with unprecedented economic data fudging, unrelenting “fake news” propaganda; and oh yeah, stealth capital controls, and police state activities – like monitoring the populations’ phone calls, emails, and text messages. Unfortunately, the slower moving “East” didn’t initially get the message; and thus, the PBOC-fostered equity “echo-bubble” spectacularly collapsed in early 2015 – when the Shanghai Composite plunged from 4,600 to 2,600 in a few months’ time. This is when it became painfully apparent that the Chinese “national team” – i.e, PPT – was created, to prevent such “free market atrocities” from being repeated – as documented by my September 2015 article, “Eastern Point of No Return.” In other words, just as the Bank of Japan “buys the dip” nearly every time the Nikkei declines, the Chinese have taken a similar tach, in making sure early Shanghai weakness ends in late-day “Hail Mary” strength; via the exact same “dead ringer” algorithm that has propped the “Dow Jones Propaganda Average” for at least the past five years, as we saw yesterday in both the Dow and Shanghai Index. In China’s case, the most loudly ticking “short-fuse time bomb” is its collapsing shadow banking industry – by far, history’s largest, and most dangerous. Which is why the Shanghai Composite’s recent decline from 3,250 to nearly the “national team’s” 3,000 “line in the sand” is so troubling – particularly when Chinese bonds and commodities are freefalling simultaneously. Not to mention, the all but shutting down of the Chinese “corporate” bond market – yielding last weekend’s “emergency meeting” of the nation’s top Financial Ministers. In other words, the Chinese are having difficulty “managing” their collapsing, historically overvalued financial markets. Too bad they don’t have the world’s “reserve currency” – which the Fed, PPT, and their Wall Street partners-in-crime have masterfully abused to prevent similar “time bombs” from going off in the equally overvalued U.S. markets. And don’t forget those Japanese. Who, four years into the “Abenomics” hyper-inflation scheme that has quadrupled the Bank of Japan’s balance sheet to a Fed-equalling $4.4 trillion, reported yesterday that inflation-adjusted real wages plummetted by 0.8% in March to a two-year low; and 0.4%, on a nominal basis; prompting soon-to-be-deposed Bank of Japan governor Haruhiko Kuroda to proclaim “the job of a Central banker is challenging.” Yes, “challenging” – as in, impossible, unless your goal is to destroy one’s currency and economic prospects, by hyper-inflating the cost of living, mis-allocating capital, and causing historic industrial oversupply that will take generations to unwind. Which in the “Land of the Setting Sun’s” case, will never occur, due to the horrifying “demographic hell” washing over it like a Fukishima tsunami. Which I assure you, wasn’t helped any by the Bank of Japan’s hyperinflationary policies of the past three decades. Here in the United States of Market Rigging and World Destruction, the Fed’s insistence that it will tighten monetary policy – albeit, from historically low levels; to barely higher, still historically low levels; has caused the benchmark 10-year yield to creep back to 2.39% from last month’s 2.17% low. Still well below the 2.5% level I four months ago claimed to be “the top” – assuming no “bond vigilante” hyperinflation fears – given that whatever’s left of the 0.7% “growing” economy, and $20 trillion in debt Federal government, would be annihilated above that level. Not to mention, the aforementioned, post-French election surge in the dollar index – which will not make corporate America happy, amidst seven straight quarters of declining year-over-year earnings; nor our “gold-supporting” President, who claims the “too strong” dollar is “killing” us. Throw in the exploding deficits last week’s hideous Omnibus spending “compromise” guaranteed; let alone, what they will become of Congress is crazy enough to enact tax cuts or elevated infrastructure and/or military spending plans, and you can see why said “short-fuse time bombs” are ticking so loudly, it makes one’s ears bleed. Not to mention, exploding student, automobile, and credit card debt defaults; the virally spreading “retail Armageddon”; a four-decade low in Labor Participation; and the increasingly desperate plight of financially-strapped Millennial’s and (non)-retirees; and you can see why something has got to give, sooner rather than later. And my favorite of all, the multi-year low in “household spending plans” reported yesterday – by the New York Fed, no less. Which somehow, doesn’t mesh with the all-time high “confidence” we’re told consumers have had since the election. This, despite the fact that actual retail sales have since plunged; and oh yeah, said spending expectations experienced their biggest decline after the election! But don’t worry, as Apple hit a new all-time high yesterday! Most likely, due to more Swiss Central bank buying, given that the SNB bought $3.9 billion of Apple shares in the first quarter alone. As for Precious Metals, they remain under attack, as the Cartel aggressively covers its largest-ever silver short position, amidst an unrelenting explosion of PiMBEEB headlines, that I assure you, won’t improve any time soon. Every market suppression tactic imaginable is being used – like suggesting falling base metals are “bad” for silver after spending months claiming surging base metals are bad for silver; just as “they” suggested a Hillary Clinton Presidency would be “bad” for PMs and “good” for stocks – until Donald Trump shockingly won, when said propaganda meme was changed – to a Trump Presidency also being “bad” for PMs, and “good” for stocks. 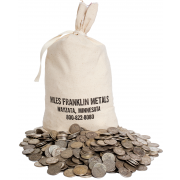 As for my personal Precious Metal holdings, I couldn’t be calmer – given not only the aforementioned tidal wave of PiMBEEB news flow, but the hard floor on prices I don’t just think, but know is in the very near vicinity. Not to mention, per this Cartel-damning chart from Steve St. Angelo, they have NEVER been able to push gold (and silver) prices below their cost of production. This, during a period when production was rising – as opposed to now, when it is in terminal decline, to the tune of 25% over the next 7-8 years. In other words, all-in production costs will skyrocket for years to come. 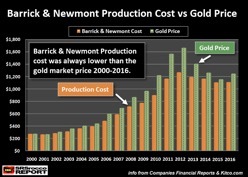 Not to mention, the fact that Barrick and Newmont, as the world’s two largest gold producers, have by far the industry’s lowest cost of production – which in 2016, was roughly $1,150/oz. 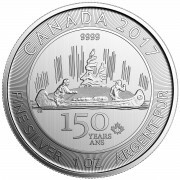 As for silver, as discussed on April 20th’s must listen, “Miles Franklin All-Star Silver Panel Webinar, Part III,” the physical silver market is in a similar position as gold – with production in decline; and production costs, for the vast majority of miners, at or above today’s historically suppressed paper levels. 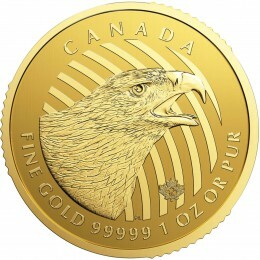 In other words, the “downside” of physical gold and silver prices is nominal at best, compared to the blue-sky upside that must inevitably be realized, as physical supply tightens amidst the most PiMBEEB political, economic, and monetary environment of our lifetimes. To summarize, never have so many “ticking, short-fuse time bombs” threatened the increasingly “challenging” Central bank manipulators. To the point that, the inevitability of one (or more) going off has never been more obvious; nor the imminence, more likely.